The Storm on Silver Lake - The Works of Joe Campolo Jr.
George is one of my oldest and best friends. We grew up together in the “Sunnyside” neighborhood of Kenosha, Wisconsin. George lived about four houses down from me, and whenever I wanted to know if George was home all I had to do was stick my head out the door and listen. George was always playing or practicing sports. If he was outside, he would be shooting hoops at the basketball net, or bouncing a ball off the side of his garage. George was one of the best athletes in our neighborhood. After high school George and I, like many of our friends in Kenosha, perfected our beer drinking skills at the “teen bars” out in the county which allowed eighteen year olds to drink beer. We had many fine escapades while frequenting those establishments. And like many of our friends at that time, being the height of the Vietnam War, we entered military service. While I went to Southeast Asia and joined in all the fun over there; George drew a lucky straw and was stationed in Germany for most of his tour. In Germany, George honed his beer drinking skills and became a master at the popular pub game of foosball. Back home and now out of the service, George and I picked up where we left off, only now we were over twenty one and could drink anywhere we wanted. Foosball tables could be found in most taverns in America now, as the imported European pub game exploded in popularity. George’s skill at the game won us many free beers as we teamed up against others during our nightly escapades. We also played on local softball teams, and George was usually the best player on his team and coached as well. (I was an adequate sub) Another activity George and I enjoyed together was fishing; and that was my specialty. We’d often pick a local lake to hit on weekends and head out with our bait, tackle and beer. We didn’t always catch fish, but we got a B for effort and an A for having a good time. One of our favorite lakes in the Kenosha area was Silver Lake. The lake offered a nice population of pan fish, northern pike, and bass; and even held a few musky. It also had a small bait shop where you could get bait, tackle, beer and rent a rowboat if you needed one. On one fine summer day we rented a boat at Silver and rowed out to an area we knew to hold a good population of pan fish. The weather was a bit over cast, but not threatening. We threw out the anchor and started rigging our gear. Before we could wet a line or pop a beer, George let out a groan. Still rigging my line, I now looked up to see what had got his attention. Looking straight west, I gasped as a huge black storm was rumbling towards us at an incredible rate of speed. Wasting no time, George brought the minnows in while I pulled up the anchor and put the oars in the water, intending to row us back to shore as quick possible. We didn’t get ten feet, however, before the powerful storm was on top of us. And powerful it was, as it lifted the front of the boat several feet and sent huge waves hurling against and over our little fishing dingy. Fighting the heavy gale, I pointed the bow into the storm and fought to keep it there, hoping to prevent us from capsizing. Between the driving rain and huge waves which were breaching the top rail, the boat quickly began filling with water. George dumped the minnows out and with the now empty minnow bucket, baled water as fast as he could. The storm winds moved us around the lake in a continuous circular pattern, but I somehow managed to keep the bow pointed into the storm at all times so we would not capsize. All of our gear was wildly thrashing around in the boat, including George’s portable radio, which was now smashed into dozens of small pieces. We could barely hear each other even when shouting, however with both of us being fully occupied in the effort to keep us afloat; we had little opportunity to speak. At one point we blew past a small unmanned sailboat that kept blowing from one side over to the other, like a grounded bird flapping around with a bad wing. We yelled in panic, fearing a collision would sink us for sure; fortunately we blew past the sailboat without hitting it. And although the storm pattern kept us circling around and around in the middle section of the lake, large objects would occasionally fly over our heads. One, a large metal garbage can flew about ten feet over our heads, while yet another, a two wheel bicycle blew past just above us. And every time we circled, we risked hitting the abandoned sail boat, as we got near it. It was like an apparition, reappearing every ten minutes or so. At one point, in a weak attempt to maintain our moral I shouted at the top of my lungs at George, asking if he wanted a beer. He looked at me incredulously but did crack a small smile. The storm raged on for what seemed to be hours to us, but after about forty five minutes in actual time the heavy stuff began to subside. Our circling pattern of the lake slowed down considerably, and as the rain and wind calmed down, our range of vision improved as well. 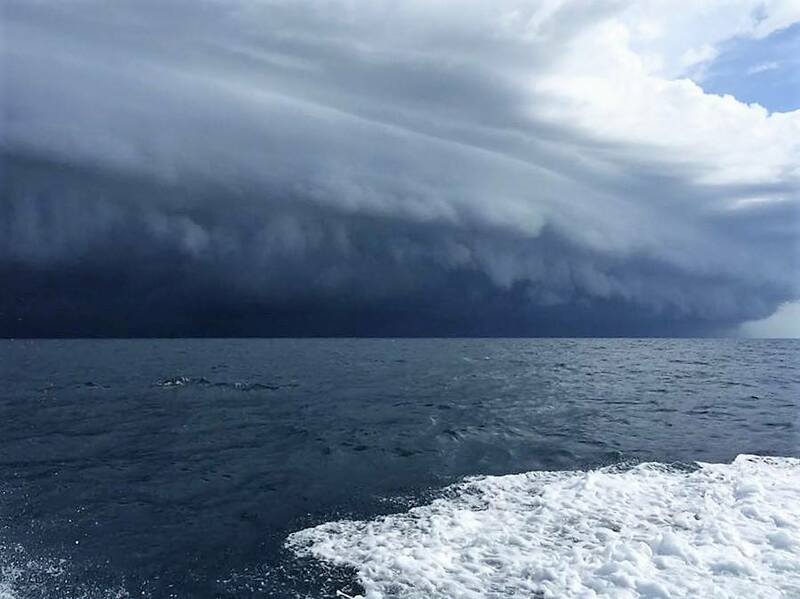 We weren’t taking any chances, however, as I kept the boat pointed into the storm, and George kept bailing, until we felt safe enough to finally take a breather. The rescue craft towed us in to about three feet of water, just off shore. They then collected their tow rope, telling us they had to double check for others who may still be out there. As they left we again thanked them profusely. George and I then got out of the boat intending to pull it to shore; but our legs were so rubbery we could barely make it in. When we finally managed to clamor onto shore, we lay down and recovered for about a half hour before we could gather the strength to walk to the bait shop, where we had started. The owner of the bait shop and a few others gathered there expressed great surprise to see us; believing we had drowned out in the lake. They gave us towels to dry off and a couple of beers to settle our nerves. We stayed there until we had fully regained our composure. When we finally got into our vehicle and drove away, we felt a sense of relief upon leaving the “scene of the crime”. The power of the storm was evident by the many downed trees and windblown debris we observed on our trip back to Kenosha. Back home we changed out of our wet clothing and rested. People were still occupied with the storm and its aftermath; many chainsaws were buzzing as downed trees and branches were now being cut up and hauled away. Later in the evening, George and I went to one of our favorite watering holes where we went through several beverages; recounting our terrifying ordeal on Silver Lake in great detail. That evening and the next day, news of the storm and its destruction was heavily covered on all of the TV news channels, and in all of the newspapers. The storm system was one of the largest to hit the Midwest during the nineteen seventies, spawning many tornadoes and thunder storms. It was later described as a super cell and was responsible for dozens of deaths and millions of dollars in damage. What hit Kenosha was identified as an F-1 tornado. The area where we had been fishing was hit the worst; so intense that a passing freight train had been derailed by the strong winds. George and I did not fish for the rest of that summer, and although George and I remain good friends, discussing our beloved Packers and Brewers, George hasn’t fished much since that time. I still fish quite a bit, and do occasionally fish Silver Lake. But every time I’m out there I remember the storm…….and keep an eye on the western sky. Enjoyed reading your blog Vivid description. Thanks for the story. Thanks; glad you enjoyed the story JoAnn!